For many people, a child is precious. He or she is a gift from God and our best hope for the future. That is why we really should do all we can to love and care for them, as well as provide for them with our best. And as we celebrate the season of joy in giving, we should remember the children that are less fortunate who have lost their parents and have no one to dote on them or to spoil them.... So, let's find it in our hearts to give them a ray of sunshine, so that they too, can shine bright in the future. Cheras LeisureMall decide to celebrate ‘Christmas From The Heart’ with the mall transformed into a glimmering wonderland, but the celebration bears deeper significance as shoppers and the community are invited to participate in the annual “Toy Bank – A Gift of Love” programme from now until 27th December 2015. This annual charity campaign allows shoppers, well-wishers and generous members of the public to bring smiles to underprivileged children’s faces by fulfilling their wishes. Come, join in and be a part of this meaningful cause. 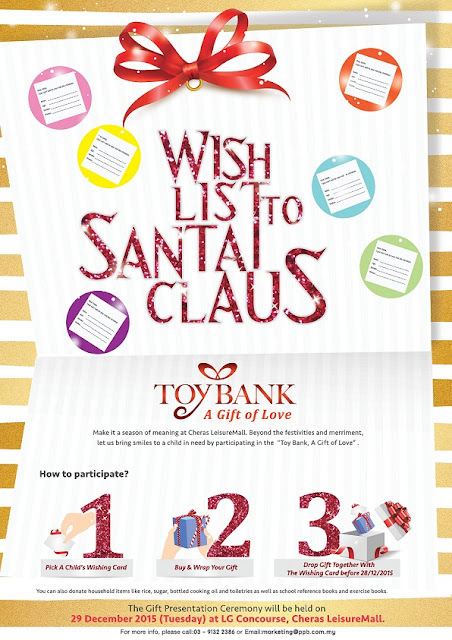 All you have to do is pick a card from the wishing tree, select a toy or gift from child’s wish list and then deposit the gift together with the wish card at the Toy Bank located at Ground Floor Concourse. The children from the respective orphanages and charity organizations will be at Cheras LeisureMall on 29 December 2015 to receive the gifts after a fun-filled day at the mall. The recipients for this year include children from Shepherd's Centre Foundation, Trinity Community Children’s Home, Persatuan Kebajikan Warga Tua Dan Kanak-Kanak WP, Pusat Jagaan Beribuan Kasih, Kajang, Bodhi Homecare Cheras, San Pedro Orphanage Home, Rumah Sayangan, Rumah Kanak Kanak Angels, Persatuan Kebajikan Kanak-Kanak Cornerstone, Yayasan Sunbeams Home, Rainbow Home, Rumah Bakti Nur Syaheera and Pusat Majudiri Y for the Deaf. “This little light of mine, I’m gonna let it shine...” Just as the famous children’s song goes, Cheras LeisureMall hopes everyone can share their little light this Christmas. They are the most sustainable and popular mall in Cheras. Somehow, I love to visit them. Now, with Xmas deco, for sure I will go there. it's such a good thing they did! nice! love that they are doing great cause as well. all the best! Will do my part to the society. Times for me to visit Cheras LeisureMall. When charity meets Santa, that will be the best ever. What a positive thing that they are doing for the children. I do hope that these gifts are educational. Thanks so much for sharing. It is good to know that so much kindness is going around, due to the christmas cheer. This is a meaningful effort by Cheras Leisure Mall afterall Christmas is a season of giving and share the joy. Hopefully the children will received their dream toy this Christmas.